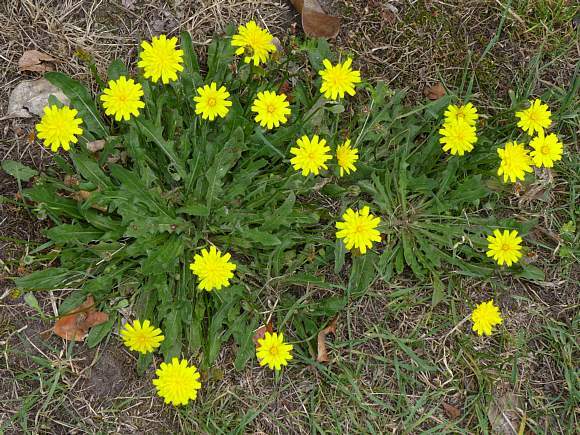 Leaves similar to those of Rough Hawkbit; long, narrow and with sinuous to cusped teeth, a bit like waves on the sea. 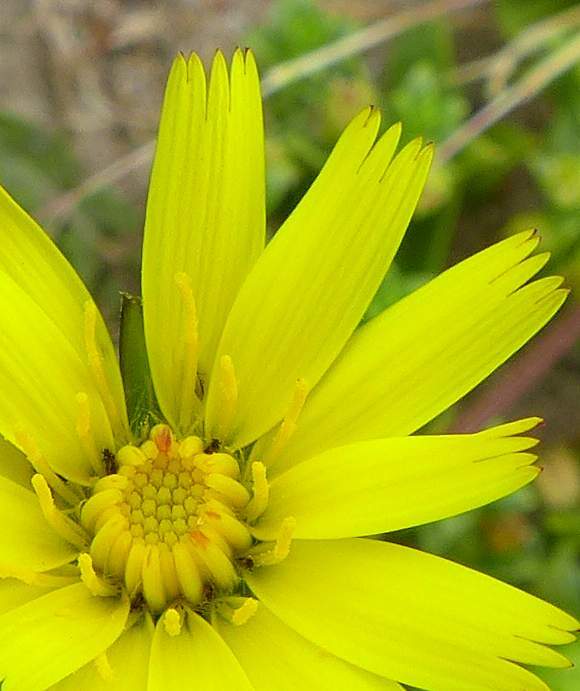 Rather smaller flowerheads than Rough Hawkbit with fewer florets and fewer bracts on the side. The hairs on the bracts are shorter than those on the much shaggier Rough Hawkbit, and there are hardly any to none on the stem. 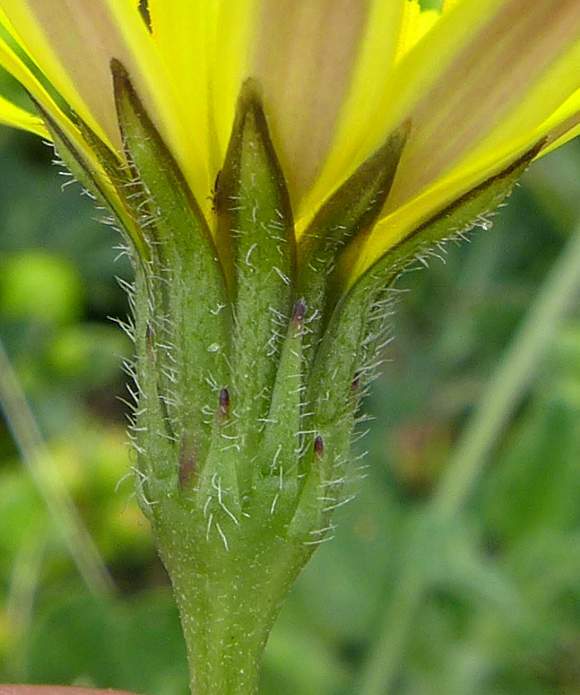 The stem thickens gradually up to the bracts (as it does on Rough Hawkbit) and there are still ridges on the stem. The bracts are similar: in that they go all the way up and folding under the flowerhead at the top, and that there are no shorter ones (as there are in Cat's-ears) (although both Hawkbits and Cat's-ear can have the odd two or three short scales on the stem). Hawkbits (both Rough Hawkbit and Lesser Hawkbit) are distinguished from Cat's-ears by their gradual thickening of stem to the flower (without any abrupt change in diameter as with Cat's-ears ). 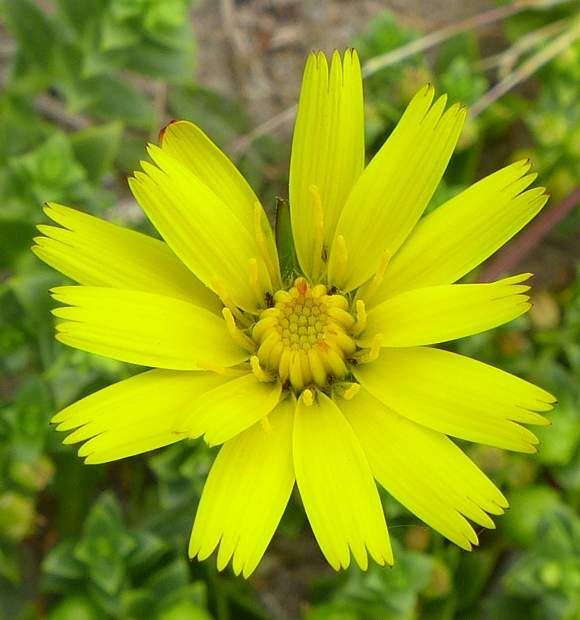 The wide long phyllaries are similar to the wide long phyllaries on Smooth Cat's-ear apart from the overlaying lower-down of extra smaller narrower phyllaries on Lesser Hawkbit (which are absent on Smooth Cat's-eye ). Phyllaries either hairless or only sparsely hairy (as opposed to usually conspicuously hairy on Rough Hawbit ). A basal rosette of leaves. Unlike Rough Hawkbit where the leaves are held aloft more or less upright, those of Lesser Hawkbit are flat along the ground. Leaves usually less hairy than those of Rough Hawkbit. Lesser Hawkbit has the same hairs which are minutely forked (or trident) at their tips as does Rough Hawbit , although they are said to be fewer hairs on Lesser Hawkbit. In these photos you cannot discern the forkiness, but you can see that many have either an extremely small T-bar at their tips or a teensy bobble. Also, any leaves with hairs which are so forked at the ends excludes the plant from being any Cat's-ear. In addition, the hairs on the mid-rib of Lesser Hawkbit are much more likely to have a red base are do those of Rough Hawkbit. Many similarities to Smooth Cat's-ear (Hypochaeris glabra) which has much wider bracts/phyllaries around the flower than other Cat's-ears, it is especially confusable with that, apart from the fact the Smooth Cat's-ear lacks the smaller and much narrower bracts around the wide bracts. Some similarities to : Cat's-ears (Hypochaeris) which have similar leaves but with usually wider gaps between the teeth. They are told apart from the differing lengths of bracts around the lower part of the flower on Cat's-ears (which are all the same full-length on Hawbits), the abrupt change in diameter from stem to flower on Cat's-ears (the stem gradually merges with the flower on Hawkbits) and the 'cockscomb' on Cat's-ears - where the ending of each bract is finely divided into a tiny comb, and the much more pronounced scales (short flaps) on the stems of Cat's-ears (smaller and fewer on Hawkbits). Some resemblance to : Hawkweed s (Hieracium) but these are usually branched, as are some Hawksbeard s (Crepis) whereas Hawkbits (Leontodon) and Cat's-ears (Hypochaeris) are not branched. 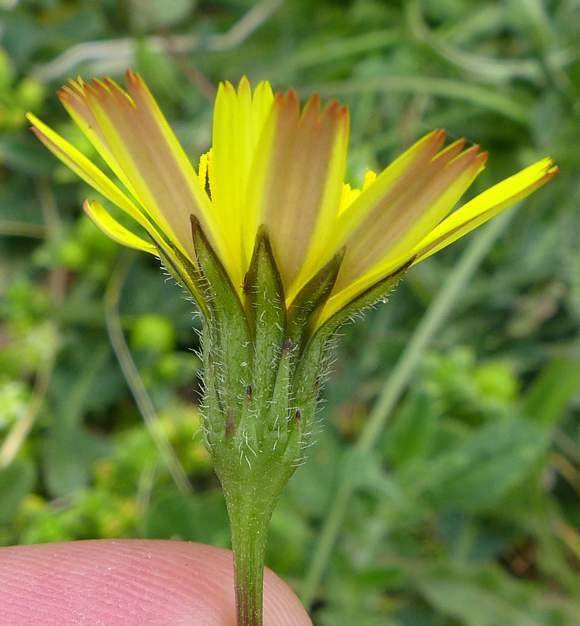 Lesser Hawkbit is most reliably differentiated from Rough Hawkbit by close observation of the seed-clock: the inner seeds of Lesser Hawkbit have long hairs but the outer circle of the seeds are capped by a slightly-splayed collar of paler-brown short chaffy scales.